Are you planning your travels? Looking for a handy travel friendly pack of hair care products to take away with you? Then look no further. Mane Hair Thickener (100 ml) Mane Hair Thickening Shampoo (100 ml) and Mane Seal and Shine (100 ml) make the perfect hand luggage travel pack whether for a weekend trip or longer. Available in our 5 top selling colours – Black, Dark Brown, Mid Brown, Light Brown and Grey. Benefit from our current sale – normal price £21.00 – current sale price only £18.00. You can purchase from our web site, from Amazon, and from Ebay. Mane Hair Thickening Spray travel size is the same formulation as our classic 200 ml Mane Hair Thickener which now has international renown because of its effective and easy to use application for thickening fine or thinning hair. Our recently launched Mane Hair Thickening Shampoo contains a wonderful new and unique formulation which will help to thicken and strengthen your hair – leaving you feeling like you have a fuller head of hair. There is also a selection of special ingredients that will help to stimulate your hair follicles and so promote the growth of new hair. Our Seal and Shine spray is a gentle sealer that will help to hold your newly, thickened hair in place and give it an added shine. All of our products are unisex. 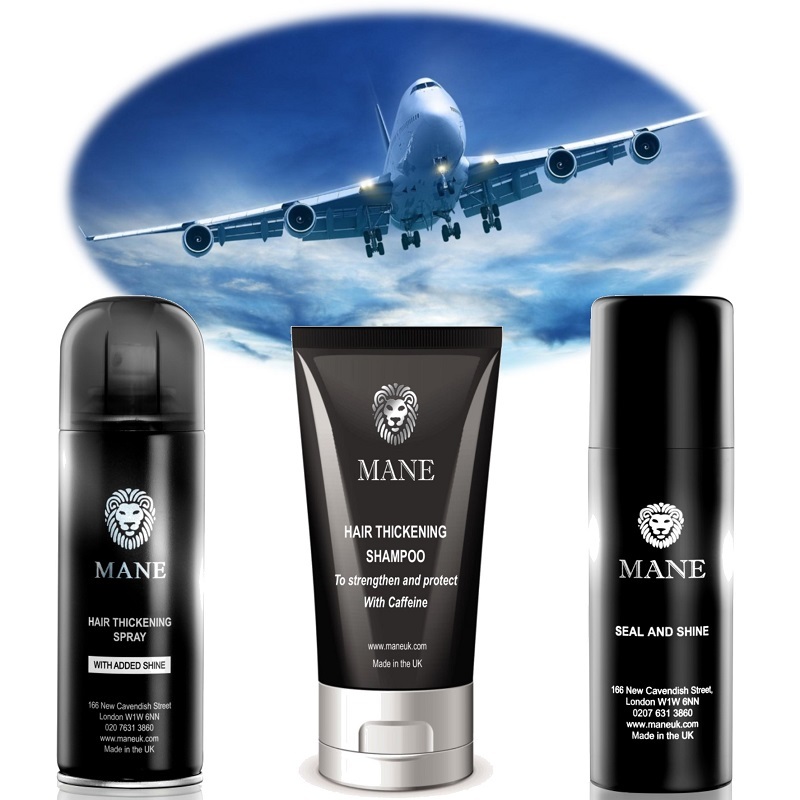 This Travel Pack is available exclusively from Mane UK Ltd.